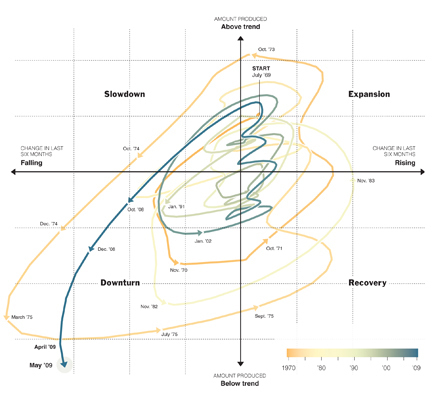 A graphic representation of boom and bust business cycles over the past 40 years. By Amanda Cox, The New York Times, July 2009. We all know that design can shape our world, but how can it help us understand it? Enter the Visualizing Finance Lab, a collaboration between faculty at Parsons The New School for Design and Eugene Lang College The New School for Liberal Arts that explores how financial narratives can be represented, and understood, visually. The lab is based in the School of Design Strategies at Parsons, which teaches students to use design to create solutions to some of the world’s most complex problems. Through an approach that marries math and social sciences with design and fine art, the lab has set out to create a dialogue about how illustrations can help create financial literacy. The lab will share its work in a three-day exhibition and programming series. It kicks off on October 22 with the opening of Visualizing Finance 1.0: Financial Narratives, an exhibition of large-scale financial illustrations that have appeared in The Economist, the New York Times, Canadian Business, Financial Times, and the Wall Street Journal. On October 22 at 2:00 p.m., the lab will present a gallery talk analyzing the exhibited works, followed by a panel discussion on establishing a common language for artists, editors, and educators to use when they talk about finance. The panel features New York Times art director Minh Uong, economist Joanne Yoong, illustrator Tim Robinson, designer Jonathan Jarvis, and economist Lucas Bernard. At the end of the panel, New York Times financial contributor Carl Richards will lead a hands-on studio in which participants create illustrations of their own. The resulting works will be added the exhibition, which will remain on view in the Arnold and Sheila Aronson Galleries at the Sheila C. Johnson Design Center at Parsons through October 25. For more information or to make a reservation, visit www.newschool.edu/events.